*The Clarksville Visitors and Convention Bureau (visitclarksvilletn.com) hosted this visit. All opinions in the article are my own. After an extensive Google Search for a restaurant, then learning our first choice only took cash, my son and I headed in the direction of an intriguing place with stellar online reviews. Campbell's Kitchen on Dover Road in Clarksville, TN sits on a stretch of road filled with a Walmart Neighborhood Market, a Dollar General, and a tire store. It’s certainly not a neighborhood where you would expect to find a place specializing in Korean and German food. Beef Bulgogi at Campbell’s Kitchen in Clarksville, TN . Schnitzel with German potato salad and coleslaw at Campbell’s Kitchen. On the outside, Campbell’s Kitchen looks like an old fast food restaurant. Inside, the place had an old-fashioned diner feel with checkerboard tablecloths and comfy booths. Neither of us were familiar with Korean food and my son had never eaten schnitzel, so this shaped up to be a night of firsts when it came to cuisine. I ordered the schnitzel with German potato salad and coleslaw and my son ordered bulgogi, a marinated beef stir fry that was simply amazing. The beef almost melted in your mouth. The schnitzel was equally good, with crispy breading and tender pork, it reminded me of the pork tenderloins in Iowa, minus the bun and toppings. This trip to Campbell's was just the start of what would be a flavor filled trip to Tennessee’s fifth largest city. Downtown Clarksville sprawls out along a high bluff overlooking the Cumberland River. In recent years, the city has seen a growth in the number of businesses downtown, many of them, great restaurants. On a three day trip (and a budget), it’s hard to try everything, but we did a pretty good job. The Blackhorse Pub and Brewery is part of the growing dining scene in Downtown Clarksville. The folks at the Clarksville Convention and Vistors Bureau treated us to lunch at the Blackhorse Brewery and Pub, a restaurant that was packed on the night before when we walked down historic Franklin Steet. Our hosts, Michelle and Theresa told us the owner also had a location in Knoxville which I knew about, but hadn't tried. We had some nachos and queso for an appetizer, a great way to start the meal. There were dozens of choices on the menu, but I eventually narrowed it down to the Reuben and onion rings. My son decided to tackle the BBQ burger (without the cheese). The others ordered the flatbread pizza and a prime rib sandwich served up Philly style with grilled peppers and onions. Everything tasted as good as it sounded and for me, the portion size was so large that I ended up with a “to go” box. Crawfish Etoufee is a true taste of Louisiana at Roux Americajun in Clarksville, TN . 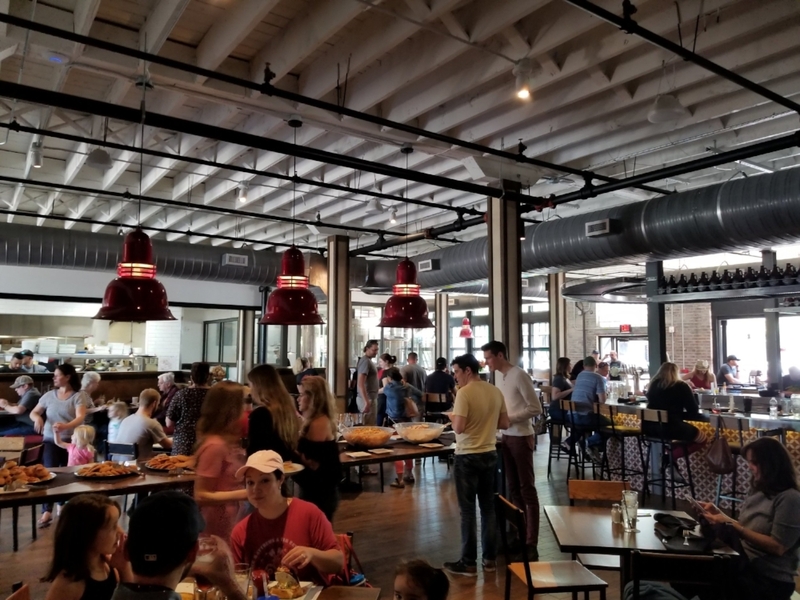 Roux Americajun takes advantage of its historic surroundings using exposed brick and tin ceilings to create an early 20th century look. Each year, our family travels to New Orleans at least once, so we are really big on Cajun food, One of the stars of the burgeoning food scene in Clarksville is a place called Roux Americajun. It’s a real taste of the Big Easy nestled in an beautifully restored building across the street from the Roxy Theater. Inside the exposed brick walls, crystal chandeliers and meticulously restored tin ceiling transport you back to the early 1900’s. There’s even a “Speakeasy” in a loft section in the back of the restaurant. The menu at Roux is simple, but don't let that fool you. Once you begin reading about the dishes, it can be difficult to figure out what to order. I had the crawfish etoufee and my son had shrimp and fries. Neither of us were disappointed. One intriguing item on the menu that several people around us ordered was a sampler of Jambalaya, Red Beans and Rice and Boudin Boulettes. (Note to self: order that the next time.) For dessert we chose the beignets. They were tasty, but just not in the same league as Café du Monde, but that was okay, because outside of New Orleans, beignets are hard to find and even more difficult to make yourself. Silke's Olde World Bread Bakery and Cafe offers a wide selection of baked goods you won't find just anywhere. Clarksville sits near the Kentucky State Line and the sprawling Fort Campbell Army Post. The latter probably explains the abundance of German and Korean restaurants scattered throughout the city. One of those serving up a taste of Germany is Silke’s Old World Breads Bakery and Café. We got a little snack for breakfast but left with a loaf of Tuscan bread and Baurenbrot, a rye like potato bread with a dense texture. We snacked on both long after we returned home. Silke's also serves up a wide variety of heartier German plates. Strawberry Alley Ale Works is one of Clarksville’s hottest dining spots. 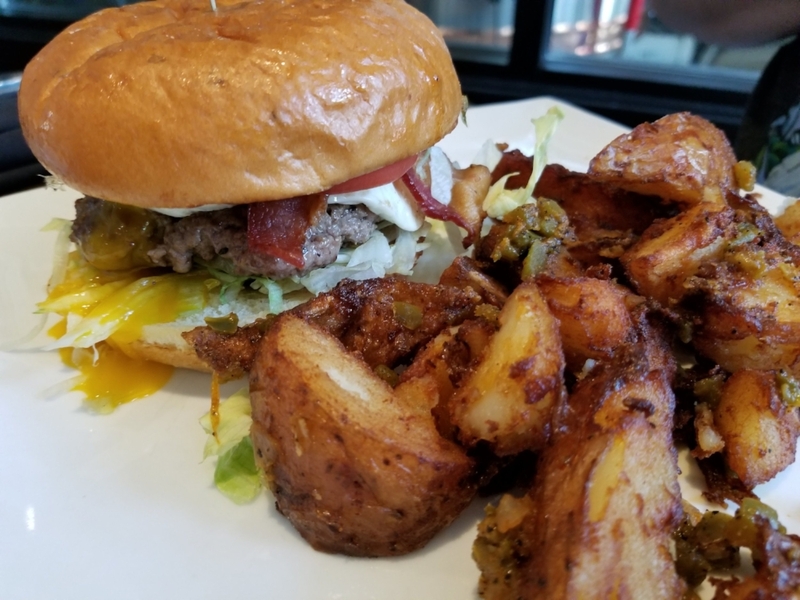 On weekends, Stawberry Alley Ale Works serves up a juicy breakfast burger topped with a fried egg. These melt in your mouth breakfast tacos are served up with breakfast potatoes with a southwestern twist. Our final meal was brunch Saturday afternoon at one of the Clarksville’s newest restaurants, Strawberry Alley Ale Works located on Strawberry Alley, a quaint side street with a whimsical children’s fountain and lots of history. Like the Blackhorse, the Ale Works is known for its craft brews. I’m not a beer drinker, but it’s obvious the other customers love it. My son and I were there for a Saturday brunch, so we didn’t get to choose from the regular menu, but that was definitely okay. My son chose the breakfast burger which was topped with a fried egg. He described it as one of the top 10 burgers he had ever eaten. I chose delectable breakfast tacos with scrambled eggs, bacon, tomatoes, sour cream and fresh avocado. Both meals came with crispy fried breakfast potatoes cooked up with peppers and onions. Brunch also comes with an extras “bar” featuring salad, deviled eggs, cinnamon rolls and fresh baked cookies. Clarksville is Tennessee's fifth largest city. The Clarksville dining scene appears to be evolving as the city continues to grow. Being only an hour from Nashville, you might be tempted to skip having a meal in Clarksville, but that would be a mistake. It’s worth the 10 to 15 minute drive from Interstate 24. Once you get a taste of the "Queen City” on the Cumberland you'll want to go back for more. If you want some good wine to go with dinner, ask if they have any Beechaven around or drive up to the winery itself and buy a bottle (or a case).